A “symbolic living room” with a sustainable approach has sprung up in the heart of downtown Kenmore, Washington. Opened last year, the Kenmore Town Square shows how investment in public spaces can transform a town’s reputation and improve livability. 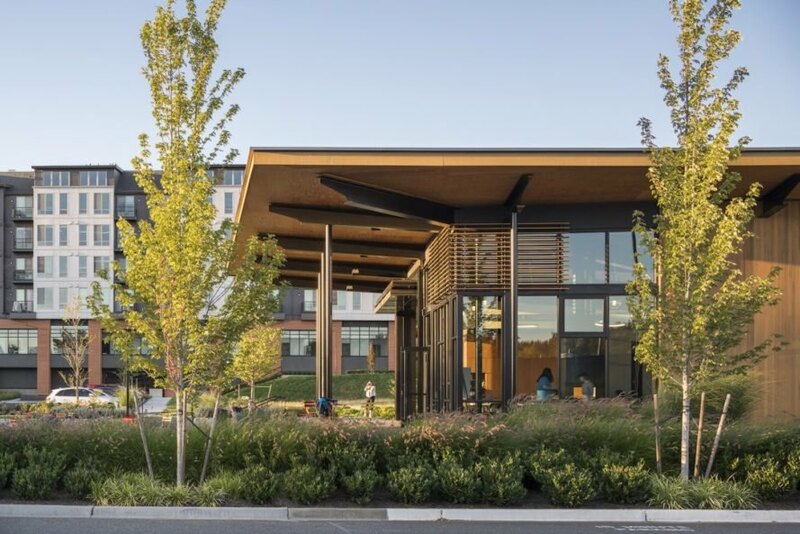 Graham Baba Architects designed the Town Square’s focal point, the $4.5 million Hangar building, which also meets the 2030 Challenge that advocates for carbon-neutral buildings. Located a few miles north of Seattle, Kenmore is shedding its image of suburban sprawl for one that embraces greater livability and pedestrian access in its downtown core. Created as part of an ambitious downtown redevelopment plan, the 24,000-square-foot Town Square and the Hangar inject vibrancy to the city core, attracting residents and visitors with diverse programming as well as active and passive spaces. Hewitt Landscape Architects served as the prime consultant and project landscape architect. 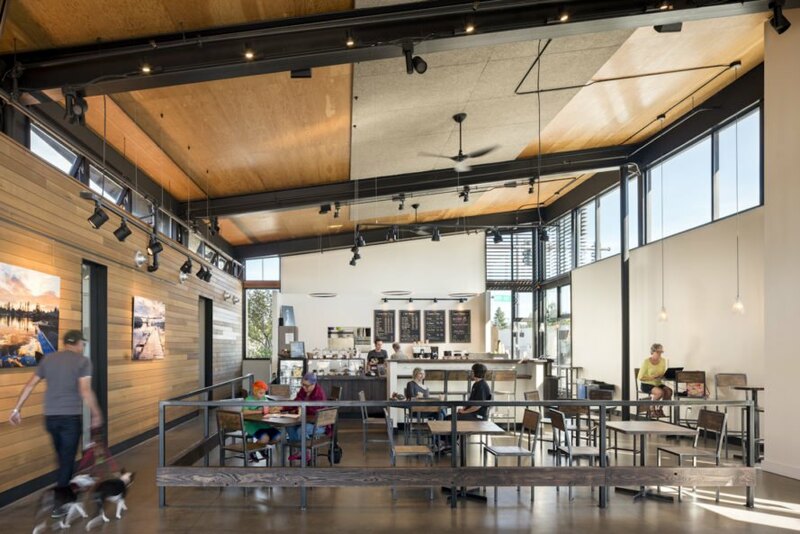 The addition of the pavilion-like Hangar promotes year-round and all-weather enjoyment of the Town Square and opens up to the surroundings via a 24-foot-wide by 16-foot-tall bi-fold window wall. Wrapped in structural insulated panels, the building is built of durable and low-maintenance materials from its steel structural beams and columns to a standing seam metal roof. A deep roof overhang shields visitors from the sun and rain. The Hangar interior features a series of flexible assembly spaces that can be rearranged with partitions. The polished concrete floor is installed with radiant floor heating and, in addition to operable window walls and large fans, provide a comfortable indoor temperature year-round. The Hangar also meets the 2030 Challenge based on the Total Project Energy Use Index (EUI) for when the project was designed (2015) and achieves a 79% reduction in CO2 emissions as compared to the typical U.S. building of the same type and size. A "symbolic living room" with a sustainable approach has sprung up in the heart of downtown Kenmore, Washington. Opened last year, the Kenmore Town Square shows how investment in public spaces can transform a town’s reputation and improve livability. 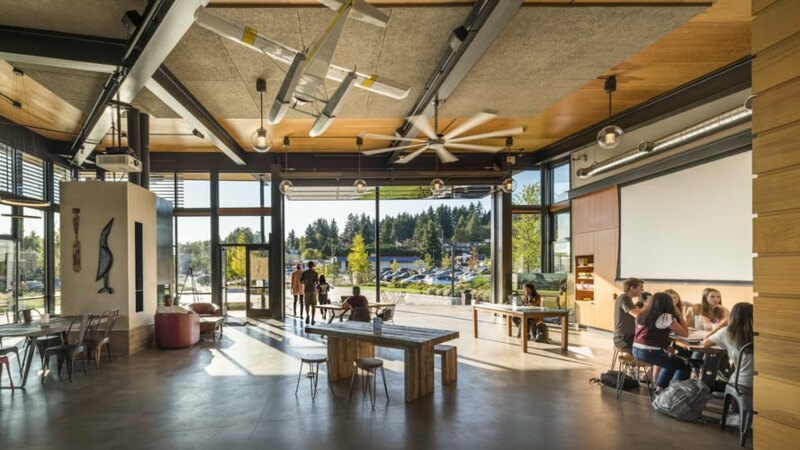 Graham Baba Architects designed the Town Square’s focal point, the $4.5 million Hangar building, which also meets the 2030 Challenge that advocates for carbon-neutral buildings. 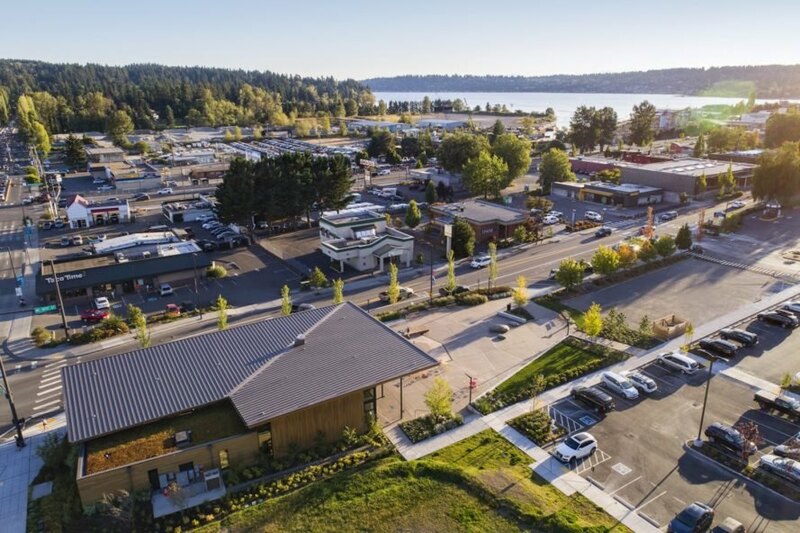 Located a few miles north of Seattle, Kenmore is shedding its image of suburban sprawl for one that embraces greater livability and pedestrian access in its downtown core. 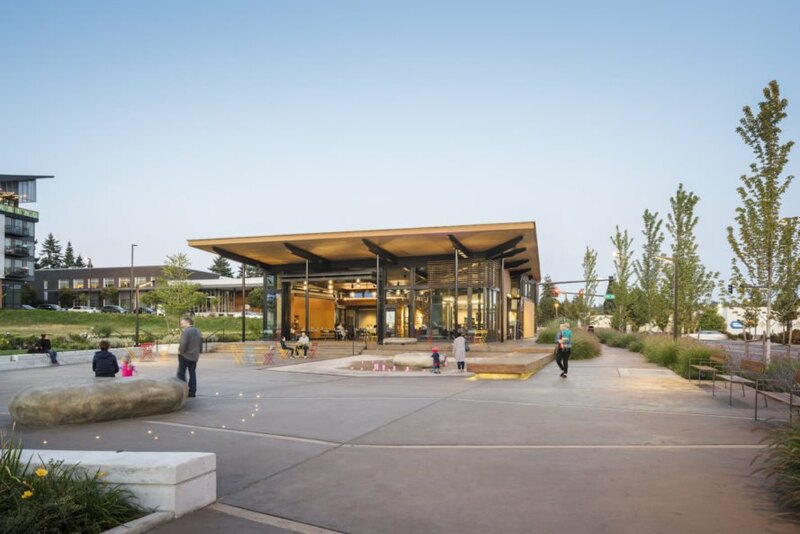 Created as part of an ambitious downtown redevelopment plan, the 24,000-square-foot Town Square and the Hangar inject vibrancy to the city core, attracting residents and visitors with diverse programming as well as active and passive spaces. Hewitt Landscape Architects served as the prime consultant and project landscape architect. The addition of the pavilion-like Hangar promotes year-round and all-weather enjoyment of the Town Square and opens up to the surroundings via a 24-foot-wide by 16-foot-tall bi-fold window wall. 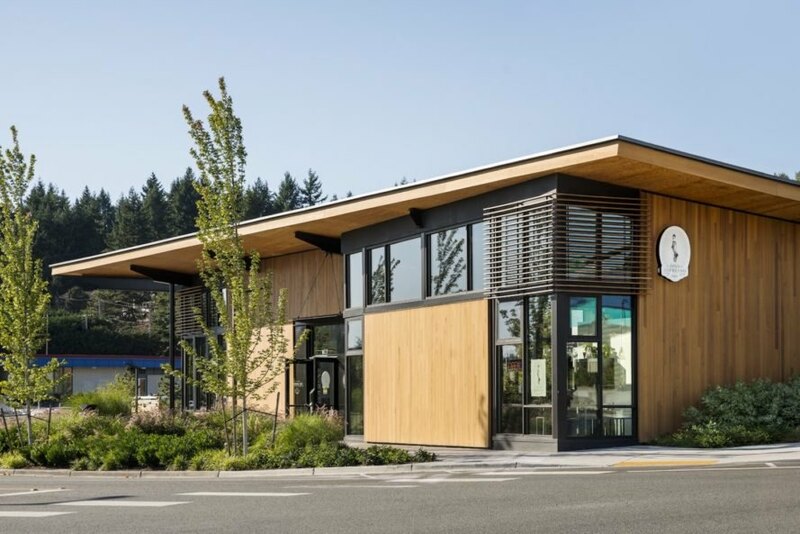 Wrapped in structural insulated panels, the building is built of durable and low-maintenance materials from its steel structural beams and columns to a standing seam metal roof. A deep roof overhang shields visitors from the sun and rain. The Hangar interior features a series of flexible assembly spaces that can be rearranged with partitions. The polished concrete floor is installed with radiant floor heating and, in addition to operable window walls and large fans, provide a comfortable indoor temperature year-round. The Hangar also meets the 2030 Challenge based on the Total Project Energy Use Index (EUI) for when the project was designed (2015) and achieves a 79% reduction in CO2 emissions as compared to the typical U.S. building of the same type and size.